Do you Click-wrap or Shrink-wrap? As a result of the current economic climate, businesses have begun to expand their search for new business globally, and more and more business is conducted across borders in the Twenty-First Century than in previous eras. 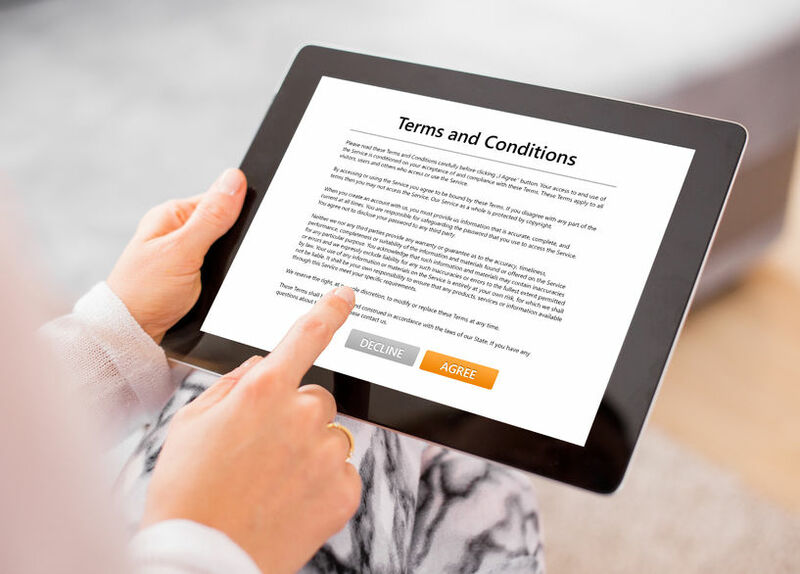 Essentially a “Click wrap” agreement refers to an agreement that appears on a computer screen and requires a user to merely click “yes or I agree” to assent to the “terms and conditions” of the transaction before viewing the website, installing software or purchasing a product from the website, and leaves no room for negotiation of those “terms and conditions”. Similarly, Shrink-wrap agreements are licence terms that are contained on or inside a software box and again, negotiation, or even discussion, of the terms contained therein is not an option. The terms thereof are in most instances drafted long before the ship even leaves the harbour for dispatch, and as any good practitioner would, in favour of their client being the licence holder/seller of the product. The Convention of 30 June 2005 on Choice of Court Agreements (“the Convention”) is an international treaty concluded within The Hague Conference on Private International Law, which came into force on 1 October 2015.
are concluded in a civil or commercial matter. The intended simplicity of the Convention as highlighted in the bullet points above, when dealing with Convention on a practical level has resulted in the application of the Convention being a little more complex than simplistic, as the scope of the Convention, if interpreted holistically, would include the exclusive choice of court agreements in non-negotiated agreements, such as online “Click wrap” and “Shrink-wrap” agreements. These types of agreements are of particular concern in light of the increased prevalence of non-negotiated agreements being concluded online, especially in the Twenty-First century where e-commerce makes it much easier to enter into binding, and often commercially complex cross border transactions, by a simple click of a button, without fully understanding the terms thereof, especially when it comes to exclusive choice of court agreements/clauses. The consequence of this is that parties that may have been unlikely to enter into such transactions prior to the availability of the internet, now regularly contract with parties located in other countries, and will be subject to the seller’s choice of forum in the event of litigation. Thus, a valid choice of court provision, nominating a court which would normally be inaccessible to a weaker party is likely to represent an effective barrier with regard to legal action ever being brought against the stronger party, especially in instances where the selected court is out of reach of the weaker party due to inter alia, the costs associated with launching legal proceedings across its borders. Service providers and telecommunications companies are opposed to the Convention in its current form as the likelihood of them being forced to defend themselves in a foreign jurisdiction, or being subject to a default judgment in the event that the action is undefended is high considering the parties with whom they contract with on a daily basis. A further concern when dealing with these types of non-negotiated agreements is that “consumers” of the service or product will be considered “businesses” due to the definition of “consumer” under the Convention being very narrowly worded. Accordingly, stronger and bigger companies when contracting with “consumers” by way of Click-wrap and Shrink-wrap agreements can exploit the narrow wording, and can essentially forum shop and choose a State with laws which may work in their favour as the exclusive forum. The problem as highlighted earlier lies in the wording of the scope of the Convention. The Convention does not adequately take account of the fact that many agreements falling within its scope involve parties with very imbalanced bargaining powers. Whilst it is true that the Convention does exclude business-to-consumer (“B2C”) agreements, as well as consumer-to-consumer (“C2C”) agreements, it is nevertheless undesirable, and indeed inaccurate, to describe the Convention as purely a Business-to-Business (B2B) Convention. The Convention does not only deal with B2B contracts; but rather with an array of parties such as non-profit organisations, as well as other parties that are not strictly businesses, but do not fit within the Convention’s narrow definition of “consumer”. Furthermore, the term “business-to-business” suggests an equal relationship; however, this is not always the case. There has been much debate regarding the way in which the scope of the Convention can be curtailed so as to ensure that non-negotiated agreements such as Click-wrap and Shrink-wrap agreements are excluded from the Convention, so as to even up the playing field. One school of thought suggests the possibility of expanding the current definition of “consumer” to include the typical transactions entered into by non-profit organisations and small to medium-sized enterprises. Another school of thought suggests adopting a definition of consumer similar to that expressed in section 4B of the Australian Trade Practices Act 1974 (“Cth”), which provision draws a distinction between a business engaged in a transaction for consumption, and situations where a business is engaged in its primary area of trade. The above two suggestions are two of many, and the wording of the Convention allows for a plethora of interpretation so as to curtail the issue of how “consumer” should be interpreted, however, the two suggestions listed above are perhaps the most practical and efficient of all the suggestion listed by various commentators and authorities on the Convention. The Convention can only be criticised for what it does as opposed to what it does not do, and new thinking in this regard opens several possibilities, for example, one could consider international harmony and commercial practicality above any jurisdictional bases. From a jurisdictional point of view, the use of exclusive choice of court agreements to oust a court’s jurisdiction that otherwise would have had jurisdiction in a particular matter is becoming the norm, especially in e-Commerce transactions. Contracting parties are looking for the most suitable forum within which to litigate, the reasons being cost, convenience and the neutrality that international forums can offer. All this being said and done, it is now the job of the courts to resolve disputes arising from these transactions. The Convention hopes to tackle this head on, and on a much grander scale than anything that has come before it. In closing, I am of the view that the Convention is a large, and necessary, step forward. Whilst at present South Africa is not a signatory to the Convention, many of South Africa’s trading partners are, and in light thereof, legal practitioners practising in the international arena ought to nevertheless advise their clients with the Convention in mind, especially when encountering exclusive choice of court clauses in any agreement, and not only under the guise of “non-negotiated” agreements, so that clients can Shrink-wrap or Click-wrap their agreements confidently.